Aim: This study aimed at quantitatively evaluating the effect of colabased beverage on the calcium loss of enamel surface pre-treated with fluorideenriched casein phosphopeptideamorphous calcium phosphate (CPP-ACPF) and βeta-ricalcium phosphate (β-TCP) using energy dispersive X-ray analysis (EDX). Materials and Methods: 24 enamel specimens were prepared from the buccal and palatal surfaces of extracted intact human premolars and were randomly assigned to study groups and control group. Specimens of Group II were pre-treated with CPP-ACPF and Group III treated with β-TCP twice daily for 4 for 28 days, followed by storage in artificial saliva. All specimens were evaluated for mineral (calcium and phosphorus) content (wt%) after pre-treatment using SEM-EDAX. The specimens were then placed in the acidic beverages for 4 days for 10 Mineral content was again measured using SEM-EDAX. Results: Statistical analysis using one-way ANOVA followed by Tukey's HSD test was applied to compare the re-mineralization and de-mineralization of the samples. Conclusion: The present study concluded that both the remineralizing agents tested were found to be effective in inhibiting the de-mineralization caused by colabased beverage. Among the remineralizing agents tested, β-TCP was found to be more effective than CPP-ACPF. The tooth enamel is a microcrystalline porous structure that allows the access of ions into its deeper layers. Tooth minerals are lost and regained constantly in normal oral environment. A key parameter considered in terms of re-mineralization is availability of inorganic constituents chiefly calcium. resence of calcium and phosphate ions during period of acid attack inhibits de-mineralization and re-mineralization. De-mineralization in the oral cavity can be attributed mainly to dental caries, intrinsic and extrinsic erosive factors such as acidic foods, beverages, medicines etc. In recent decades researchers have shown a marked interest in studying the cause, process and management of both de-mineralization and re-mineralization of tooth structure. Erosive tooth wear or dental erosion has progressively gained more attention from the dental profession since the decline in dental caries. Excessive consumption of acidic food beverages are one of the most common extrinsic factors that cause dental erosion. Although, the de-mineralizing effect of acidic food beverages on human enamel has been well documented, the role of potentially protective agents that can inhibit this effect has not been investigated. Several studies have been reported on the use of remineralizing agents in the management of de-mineralization arising from dental caries. However, there are only a few reports on the effect of acidic food beverages on enamel and even fewer on role of remineralizing agents in preventing the loss of minerals from the tooth structure previously treated with remineralizing agents. 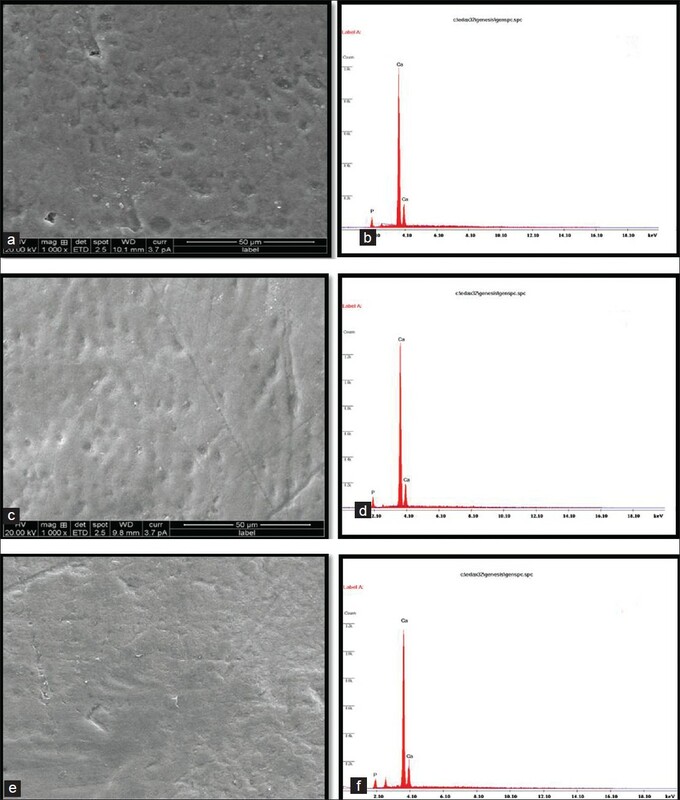 Hence, the aim of this study is to evaluate the effect acidic food beverage on the calcium loss of enamel surface pre-treated with various remineralizing agents. The specimens were treated with remineralizing pastes once in the morning and once at night and were rinsed after each application and then stored in the artificial saliva. After the samples were remineralized for 28 days, they were immersed in 5 ml colabased beverage for 10 for 4 days. After immersing in the cola solution, the samples were not rinsed and were directly stored in the artificial saliva. Specimens were stored in artificial saliva throughout the study, both after surface application of the test materials and exposure to acidic food beverages. All the specimens were subjected to analysis using scanning electron microscopy (SEM)energy dispersive X-ray analysis (EDAX) (JEOL, JSM-840 A, Tokyo, Japan). Statistical analysis of the data was done using oneway ANOVA (Analysis of variance) test, Tukey HSD Test SPSS (Statistical Package for Social Science) software version 15 was used. 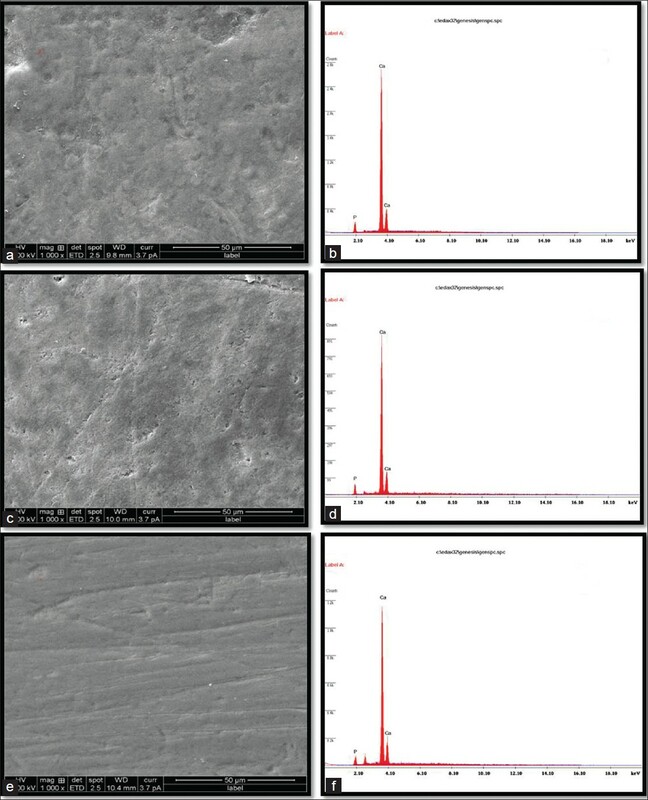 SEM-EDAX analysis was used to determine calcium and phosphorus content in demineralized and re-mineralized enamel in each group [Figure 1] and [Figure 2]. [Figure 1] a and b represents the surface and elemental representation of a section of sound enamel respectively. [Figure 1]c represents the enamel surface after treatment with CPP-ACPF, showing occlusion of the enamel surface with calcium and phosphorus minerals which has been supported by EDAX graph [Figure 1]d.
When the means of all the groups after demineralization were compared, the least Ca/P value was observed in ontrol group and highest with β-TCP. Dental erosion has reportedly shown an increased incidence in adolescents, especially after consumption of acidic beverages such as carbonated soft drinks. Recently, new remineralizing materials, β-TCP and CPP-ACPF paste containing fluoride, introduced to the market. None of the studies studied the protective antierosive effect of these materials on permanent teeth. Colabased beverage was used in this study to induce artificial erosive effect as in other studies ,, since it is commonly consumed acidic beverages amongst the youngsters. The cola drink was changed every cycle to ensure it was carbonated. The containers containing the cola were hermetically sealed as removal of gas from the drink increases its pH and decreases its potential of dissolving hydroxyapatite. The specimens were incubated in artificial saliva to simulate the oral conditions. The results of the present study showed among the remineralizing agents used β-TCP was found to be highly effective and showed better preventive effect. Both the remineralizing agents tested were found to be effective in inhibiting the demineralization caused by cola-based beverage. 1. Nikiforuk G. The Nature of Tooth Substance. The Caries Process-Morphological and Chemical Events. In: Understanding Dental Caries; Basic and Clinical Aspects: Etiology and Mechanisms. Nikiforuk G, editors. Vol 1. Canada: Basel: S Karger,1985. p. 261-89. 2. Badr SB, Ibrahim MA. Protective effect of three different fluoride pretreatments on artificially induced dental erosion in primary and permanent teeth. J Am Sci 2010;6:442-51. 3. Tantbirojn D, Huang A, Ericson MD, Poolthong S. Change in the surface hardness of enamel by a cola drink and a CPP-ACP paste. J Dent 2008;36:74-9. 4. Hegde MN, Shetty S, Pardal D. Remineralization of enamel sub-surface lesion using Casein Phosphopeptide Amorphus Calcium Phosphate (CPP-ACP). J Conserv Dent 2007;10:19-25. 6. Karlinsey RL, Mackey AC, Walker ER, Frederick KE. Spectroscopic evaluation of native, milled, and functionalized β-TCP seeding into dental enamel lesions. J Mater Sci 2009;44:5013-6. 7. Karlinsey RL, Mackey AC, Walker ER, Amaechi BT, Karthikeyan R, Najibfard K, et al. Remineralization potential of 5,000 ppm fluoride dentrifices evaluated in a pH cycling model. J Dent Oral Hyg 2010;2:1-6. 8. Pantera EA Jr, Schuster GS. Sterilization of extracted human teeth. J Dent Educ 1990;54:283-5. 9. Centers for disease control and prevention. Guidelines for infection control in dental health-care settings-2003. MMWR Recomm Rep 2003;52:1-66. 10. Jensdottir T, Holbrook P, Nauntofte B, Buchwald C, Bardow A. Immediate erosive potential of Cola drinks and Orange juices. J Dent Res 2006;85:226-30. 11. Arends J, Bosch JJ. Demineralization and re-mineralization evaluation techniques. J Dent Res 1992;71(special issue):924-8. 12. Karlinsey RL, Mackey AC, Walker ER, Frederick KE. Surfactant-modified β-TCP: Structure, properties, and in vitro remineralization of subsurface enamel lesions. J Mater Sci Mater Med 2010;21:2009-20. 13. Lennon AM, Pfeffer M, Buchalla K, Becker K. Effect of a casein/calcium phosphate containing tooth cream and fluoride on enamel erosion in vitro. Caries Res 2006;40:154-8. 14. Reynolds EC, Cai F, Cochrane NJ, Shen P, Walker GD, Morgan MV, et al. Fluoride and Casein phosphopeptide - Amorphous calcium phosphate. J Dent Res 2008;87:344-8.